Every so often I’m fortunate enough to come across an unfamiliar hip-hop artist who consistently delivers enjoyable hiphop. This time the guy I came across was this underground New York artist. I was egar to learn more about him. How did you come up with the name Sev Statik? I used to go by SEVEN. The #7 being a number to represent God or perfection. I wanted to reflect my faith in Christ in my name. I read a scripture one night in the Bible (Rom. 3:23) and it reminded me that we all fall short of the glory of God, so I shortened to humble myself with just SEV. The STATIK part of my name came to me in a freestyle and I kept it to represent the “distortion” my art brings. I wanna shake up people, gett em to move a bit. I wanna make’m stop what they’re doing and look at something that could change their lives so I put that idea inside my name. Where abouts in the universe do you roam? Strictly in the 518, upstate Albany NY. I rock shows where ever I can, weekend warrior style of course. I’ve traveled the nation back in 1992 on tour with a Rock band called WhiteCross. I opened up their shows with a live band for a year and a half. I get see my Tunnel Rat fam about twice a year for recording. Last year it was just once, but we’ve been doing the mail recording thing for the 7 ep series. I saw my Deepspace5 crew this past January in Atlanta to record our new album. I get around on the goodfoot. Had you grown up somewhere other than New York, do you think you’d still be as much involved in hiphop? I think the fact that I was here almost since the beginning has a lot to do with why I’m still a “citizen” of Hip Hop culture. When I was introduced to Hip Hop it was through breakin and graffiti, it wasn’t music yet. I saw the visuals before I heard the art. I remember dubbing all the tapes my peoples had around the way and listening to DJ Passion on WCDB, a college station. If I was anywhere else I wouldn’t have had the first hand experience even being 3 hrs away from where we were getting it from which was NYC. DJ Toast locked me in with college radio since 1990 along with Money Mike, DJ Rad and Mr. Samples who all play(ed) what I consider to be real hip hop. And these cats are still doing music, still playing records and DJ’ing… so, if i grew up somewhere else would I be who I am today? No. I’m glad I grew up in the 518. This is my home. PCM, STAND UP! How long have you been recording music for and what were the initial artists which motivated you to step up on the microphone? I’ve been professionally recording for over 10 years. Seems like a long time, but it was yesterday that I started writing. The first artists I fell in love with were the Fat Boys, Kurtis Blow, Lisa Lisa, UTFO etc… all the early, early cats. I loved the style of the music – it fit my walk, my art, my attitude… all that. But the emcees that influenced me to spit “for real for real” were Rakim, Big Daddy Kane, MC Lyte, Latifah, KRS-1, LL, Run DMC, Juice Crew, Ultramagnetic.. etc. Then came Freestyle Fellowship, Organized Konfusion, DITC, 3rd Bass, Beasties… that was when fools really cared about the art and the music was really good. Could you run us through the key releases you’ve dropped which we should all check out? As far as official releases, not considering 12” or EP’s, the people have to know about Speak Life (‘02) and Slow Burn (‘05) the Sev Statik full length albums out now. I also released 2 other albums under the name Stu Dent, Altered State (‘01) and Nephilim (‘03). The first Stu Dent record in ‘01 was my first official full length to be released. So, right know I’m thinking which name is the alias and which is the frontline professional name… hmmmm? So, 4 lp’s since 2001 aint bad, plus 3 group albums since 2000 with one on the way in May. Sounds like I’m talking about kids now. What record in your discography do you consider as the best sample of what you do, that prospective listeners should try out? You can pick up anything of mine… my music is timeless, word up. If you happen to pick up any one of my crews records you’ll see why we keep making music. We love what we do. 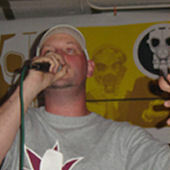 You’ve shared stage time with some huge names including KRS One, Common and Organized Konfusion. Looking back, what was the best of those shows and what’s your best on stage memory? Rats, just produced his next record and my peoples Propaganda and Raphi are guests on it. So, what KRS! What’s the biggest difference between the hiphop of 1996 when you dropped your first EP, and now? Well, a lot has changed with promoting, distributing and recording music because of technolgy. And since the beginning of emceeing emcees have always been bragadocious about their style, jewelry, cars, woman and clothing… that’s all still here, but it’s to the 10th power. It’s kind of sickening and scary because we have a young generation of hip hop heads that believe that’s the definition of success. Am I putting blame on those successful rappers who have the right to live that way? Yea. Of course. Who else is to blame when little Jamal at age 9 says he’s a “gangsta-pimp”? And uhhh, in 1996 if you bit another emcees line you were called a “biter”, now all we have is biters. Biters of style, music, beats, hooks…. Sean Carter steals Biggie’s lines all the time. Puff has stolen half of what was dope and remade it into R&B… and we’re OK with that? BUT, the independent scene is way bigger now. Fools are not looking for label deals anymore. They’re pressing their own product and booking tours on their own. A lot of great things have happened since ‘96, but a lot of negativity has been born as well. HipHop, until ‘96 ‘97, kept it’s beef on wax kept it off the streets and on white sheets. Now we got dudes holdin’ heat (I just rhymed and I didn’t mean to. Cuz I’m dope). It’s taken about 10 years for a whole culture to fear itself. Talk about your worst enemy, greatest allie. This is it. Have you got any releases or projects in the work or about to be released? Slow Burn is the newest release (3.1.05) which features production from Shawn J. Period, Joey Beats and Dert (PCM/Day By Day). My crew Deepspace5 will release it’s 2nd lp on May 10th (Gotee/EMI) with a DVD. I have an EP for the Tunnel Rat VII EP series late this year as well as another full length album with production by DJ Dust of Mars ILL (DS5). My 518 family PCM is setting a date for this summer to release our first piece of wax as a collective. It’s a vinyl EP featuring up and coming artists from our area. We have some strong cats here puttin’ it down and making good hip hop music. Also, planning on another Stu Dent project, but i think i’ll have to wait til early ‘06. Workin’ workin workin…. Who do you rate on the independant hiphop scene in the states right now? Independent cats are the bloodline of this culture. Without them a lot of online and print magazines would not exist. Like I already stated artists are taking their music careers into their own hands. Doing it their way. A lot of networking is being done here in the U.S. and artists are taking advantage of it… as they should. Cats like Finger Print Records, Fallen Angels, Stronghold and of course my whole PCM foundation here in Albany NY. There’s other underground communities out there with a lot of dope cats. Some are stuck on ego and can’t build with other cats coming up or doing the same thing they are. Some groups think they should get paid $500 a show because they’re signed to a well known idie… not if the local artists draw more people than you do! We know who will draw and who won’t. These dudes get record deals and get on this “I made it” tip “So pay me”. Nah. I’ll take the next HUNGRY emcee who wants to earn a new fanbase and network with artists that are just as edicated as they are. So, take your “super well known producer” 12” and melt it down and make a new line of G.I. Joe metrosexual action figures. What are a few of the producers and artists which you’d most jump at the chance of working with? Production wise – 9th wonder, Maker, White Lightening, Blueprint, RJ-D2… on the emcee front I would definitely like to work with Pharaoh Monch, Slug, ILLogic, Qwel and a few other cats I respect. If the artist adheres to a higher power when they write, it comes across in their music and i think these cats have a voice inside them they listen to. It reminds fans of their humanity and divinity without holding them on a pedistile, but definitely in high regards. There something about the artists I mentioned that everyone knows what I’m talking about. Something different and that’s what most want when they look for new music. Are you cool with people downloading your music or are you strictly anti bootlegging? Hey, if you can get it FREE then go ahead. I encourage listeners to BUY the music, no doubt, but if you have a chance to kopp it without droppin’ scrilla, by all means. I want heads to hear my music. I want heads to $upport my music too. It’s definitely a give and take with fans. Just gotta go with the flow and keep puttin’ out new product. The more people hear it, the stronger the buzz. They’ll buy something at some point. The support factor is catching on because I’ve had a grip of heads buy my music from my site and then email me saying they already had it from a friend, but wanted the real cd. So, it’s a neverending chain reaction… for every 10 downloads of my album there’s 10 supporters. That can only multiply both ways and interchange. Bootleg it. Buy it. Bump it. Dooo it. Have you got any shout out’s you wanna drop? preview the new album Slow Burn at www.purevolume.com/sevstatik purchase the new album Slow burn at www.sevstatik.com :) got some dope hoodies, tees and other fresh releases as well. For new music coming out of the 518 check www.pitchcontrolmusic.net It’s some of the dopest hip hop you might not’ve heard yet. Peace and God bless. yo bra, so ive been noticing Statik being tagged in the cities around me. It is the best graffiti i have EVER seeen. this stuff is high quality. i was just wondering if it was u who does it. haha. probably not but hey, it is damn good. so yeah..